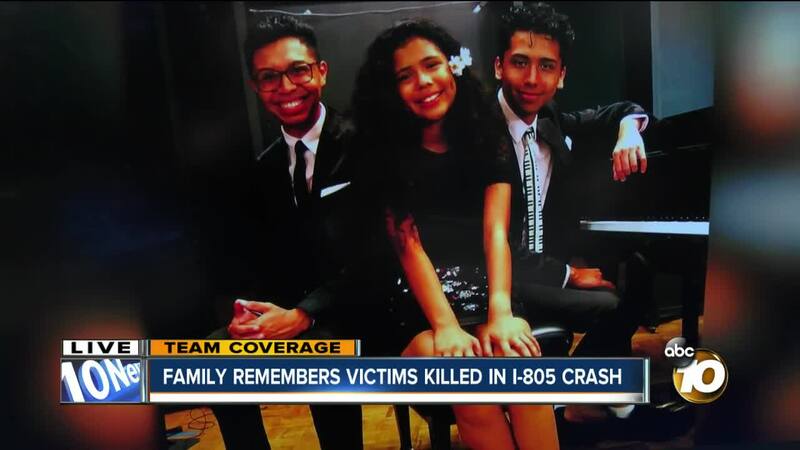 SAN DIEGO (KGTV) — Dominic Pizarro lost his mom and his little sister on Thursday, after a wrong-way driver drove into their SUV on Interstate 805. Pizarro spoke with 10News as he and his grandfather drove back to San Diego to support Dominic's older brother - who was the first to hear the tragic news. Trevor Heitmann, 18, was behind the wheel of the 2014 McLaren sports car that collided with the SUV, killing himself, and 43-year-old Aileen Pizarro and her 12-year-old daughter, Aryana. "Both of them were the most caring...people full of life, you've ever met in the world," Pizarro said. The way his mother and sister died has dominated local news outlets since it happened. Heitmann was traveling at high speeds Thursday, heading southbound in a northbound HOV lane at about 4:30 p.m. near La Jolla Village Dr. before the collision, CHP said. Troopers believe he entered via an HOV lane access at Carol Canyon Rd. Pizarro said his family was as close as can be - the siblings were all musicians. "(Aryana) was just the most unique little girl in the whole wide world," he said. "She was your average girly girl at times, and at times she was this feisty little 12-year-old who was just so smart, so mature for her age." The siblings were raised by their mom and grandfather. Their mom Aileen was a therapist devoted to helping others. "Everything (my mom and grandpa) had went to us," Pizarro said. "Every single dollar, every single cent was put into me and my brother and sister." Pizarro said the family will never forget their caring mother and feisty sister, as he also recalled the last conversation he had with Aryana. "She was showing me all these unicorn things she got, unicorn pencils, unicorn notebooks," he said. "She was showing me everything that she was going to wear or take to school because she was so proud of everything that mom had gotten her for school." Aryana was set to start seventh grade at the School of Creative and Performing Arts on Monday. Pizarro set up a GoFundMe page to support the family during this tough time, but also asked those aware of the story for their prayers.